Bernard was stuck. Getting help wasn’t simple. This is a story about a cat rescue. It’s also a story about government bureaucracy. 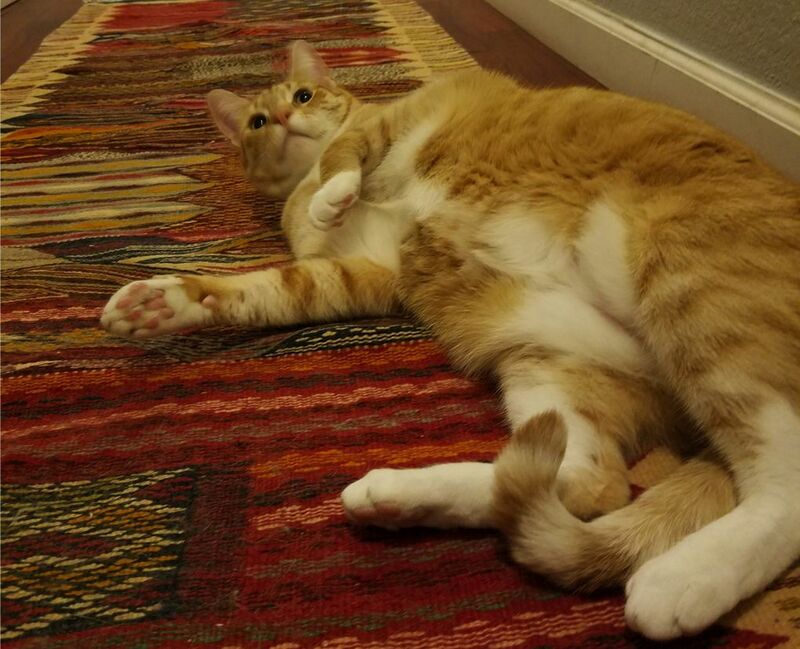 It all started Friday morning in a West Seattle alley, when Abi Harmon came out looking for her 4-year-old orange and white cat Bernard, aptly nicknamed Tubby. He hadn’t come home the night before. 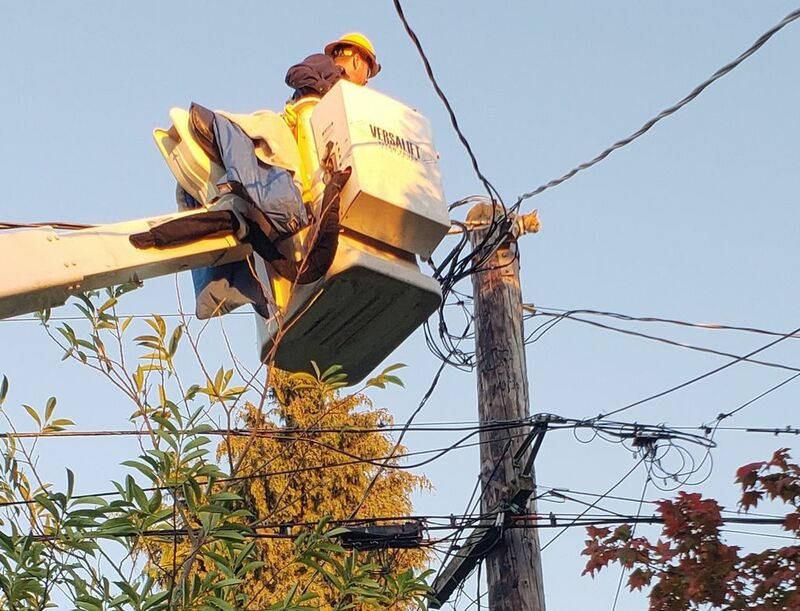 When Harmon looked up — all the way up a 40-foot tall wooden utility pole, above a web of electrical wiring — there was Bernard looking back down at her. Maybe Bernard got spooked by a raccoon or a dog, or maybe he just wanted to see if he could get all the way up there. We’ll never know. What do you even do in this situation? Harmon figured her first line of contact was the non-emergency number for the Seattle Police Department. The dispatchers there said they couldn’t do anything, but made some suggestions on where to turn next. Harmon then walked over to her neighborhood fire station, which happens to be at the end of the block. Firefighters famously rescue cats stuck in trees, right? But this was a light pole, with live wires ringing the top, and it was too dangerous for fire crews, she said they told her. OK, what about the department that handles electricity? That would be Seattle City Light. So Harmon gave them a call, too. It was quiet there — a nice day out, not a lot of outages to deal with – so they told her they might send someone to take a look, she said. Meanwhile, Harmon and her husband called various private alternatives — like arborists, who apparently sometimes rescue cats in between whatever else arborists do, according to the couple’s internet research — and a couple of animal-rescue crews the police had passed along. But Harmon said no one would come out because of the whole live-voltage situation. Later that afternoon, Harmon said someone from City Light did show up to the alley behind 38th and 37th Avenues Southwest, just south of Southwest Alaska Street. But she said crews told her they didn’t have the equipment necessary to get to the cat and couldn’t shut off the power. Again, no luck. So they called the Fire Department again, which agreed to dispatch a crew. And she again called the police, which also sent officers (it was also a quiet day for crime, apparently). It’s at this stage that the neighbors began believing they might be the heroes needed to rescue this cat. 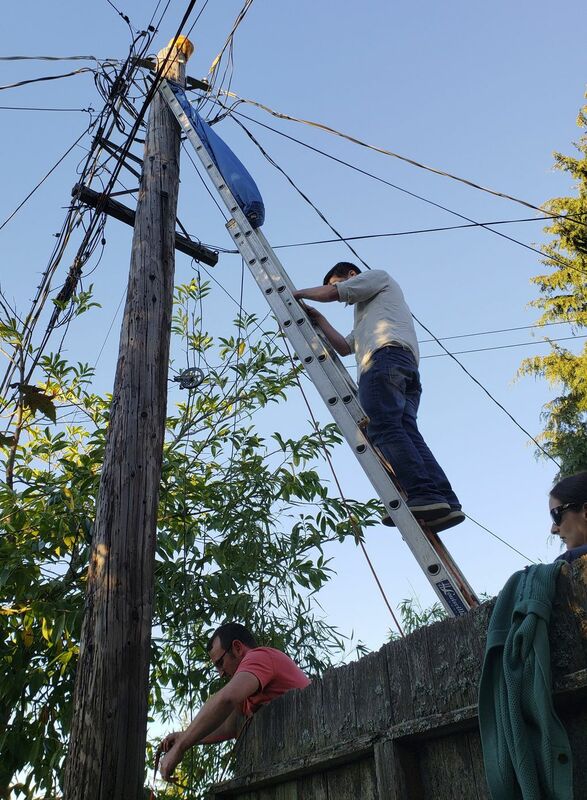 They jury-rigged some MacGyver contraption using a 30-foot ladder with a long wooden board topped with a sleeping bag. The plan was to get Bernard to jump onto the sleeping bag. Yet another call was placed to City Light. Another dead end. “Everyone was sort of passing the buck,” she said. During all this, Bernard remained atop the pole, meowing at the top of his little lungs. The cat clearly was not coming down on its own, no matter how much food was left out. Eventually, one of Harmon’s friends involved in politics on the East Coast suggested maybe they should contact their local council member. An email was placed to Lisa Herbold, who represents West Seattle, and 16 minutes later, an aide responded back, copying the council liaison to City Light. Soon after that, a City Light crew came out with a bucket truck and immediately rescued the cat. “They didn’t say why or how” they didn’t send the bucket truck before, Harmon said. Both she and the cat were in good spirits Saturday but Harmon lamented all the resources the city spent on an effort that had a simple solution all along. In all, it took nearly 12 hours from first call to rescue. Photos Harmon provided showed at least five firefighters and police officers responded. Scott Thomsen, a spokesman for City Light, says the timing of the rescue after the outreach to Herbold’s office must have been a coincidence: He says the Fire Department eventually decided it was going to do the rescue itself, and contacted City Light to ask for support. City Light then dispatched the bucket-truck crew, and when it arrived, the team realized it could use the truck to just do the rescue themselves. “Our decision was not as a result of any political pressure, it was to support the Fire Department,” Thomsen said. Hilton Almond, a public information officer for the Fire Department, said Saturday he wouldn’t be able to talk to the fire crew involved until Monday. Generally, he said, a rescue atop a light pole would be a no-go for the Fire Department. “If there are live wires, then we cannot do anything because of the possibility of our firefighters being electrocuted,” Almond said. For her part, Herbold said that while “it seemed like City Light sprung into action” after her staffer’s email, “I can’t say one way or another” if the utility responded solely because of her office’s intervention. “One thing we can say for sure is, the squeaky wheel gets the grease,” Herbold said. Thomsen said City Light was initially reluctant to do a rescue because it’s simply not their job: “Our function is to deliver electricity. So we try to stay in our lane,” he said. “We’re not in the cat-retrieval business,” Thomsen said. 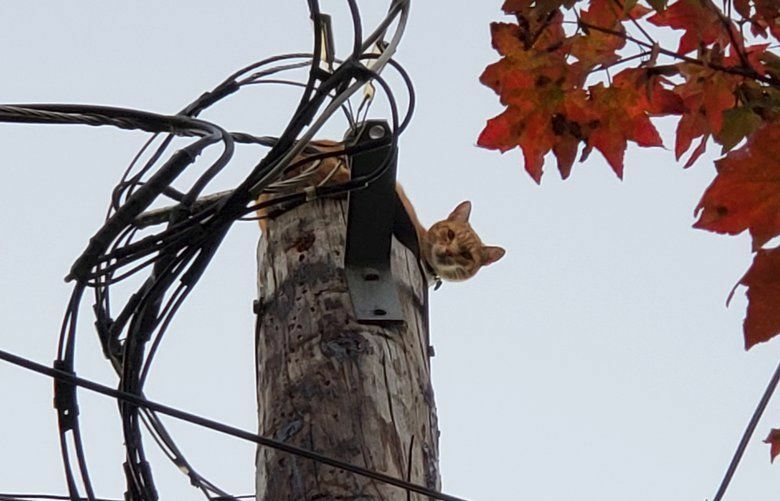 “When you start doing this, you start getting calls from every cat owner.” When people call about a cat on a light pole, they tell them to wait for the cat to come down on its own, which usually happens when the cat gets hungry enough, Thomsen said. Bernard is now back inside and happy and eating enough to regain his Tubby nickname. “I’ve never seen him purr so much,” Harmon said.